In test codes and standard specifications, certain technical terms are used to specify and define conditions or procedures. Hence, commonly used technical terms are defined here before the actual testing techniques are discussed. This is defined as the High Voltage Testing Techniques which produces the loss of dielectric strength of an insulation. It is that High Voltage Testing Techniques at which the electrical stress in the insulation causes a failure which includes the collapse of voltage and passage of current. In solids, this causes a permanent loss of strength, and in liquids or gases only temporary loss may be caused. The voltage which has to be applied to a test object under specified conditions in a withstand test is called the withstand voltage [as per IS: 731 and IS: 2099­1963]. This is the voltage which has a probability of 50% flashover, when applied to a test object. This is normally applied in impulse test in which the loss of insulation strength is temporary. The voltage, that causes a flashover at each of its applications under specified conditions, when applied to test objects as specified, is hundred per cent flashover voltage. It is the shortest distance on the contour of the external surface of the insulator unit or between two metal fittings on the insulator. Alternating test voltages of power frequency should have a frequency range of 40 to 60 Hz and should be approximately sinusoidal. The deviation allowed from the standard sine curve is about 7%. The deviation is checked by measuring instantaneous values over specified intervals and computing the nns value, the average value, and the form factor. Impulse voltages are characterized by polarity, peak value, time to front (tf), and time to half the peak value after the peak (tt). The time to front is defined as 1.67 times to time between 30% and 90% of the peak value in the rising portion of the wave. According to IS: 2071 (1973), standard impulse is defined as one with tf = 1.2 μs, tf = 50 μs (called 1.2/50 μs wave). The tolerances allowed are ± 3% on the peak value, ± 30% in the front time (tf), and ± 20% in the tail time (tt). The electrical characteristics of the insulators and other apparatus are normally referred to the reference atmospheric conditions. Since it is not always possible to do tests under these reference conditions, correction factors have to be applied. In some cases, the following test conditions are also used as reference (British Standard Specifications) conditions. 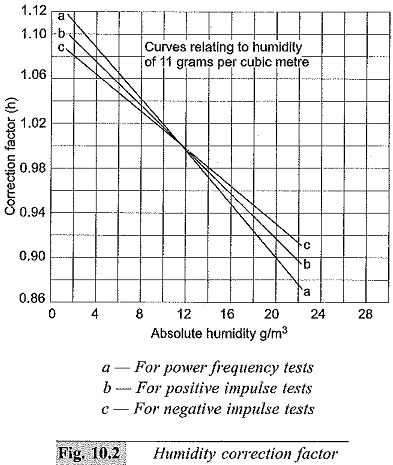 d = air density correction factor. 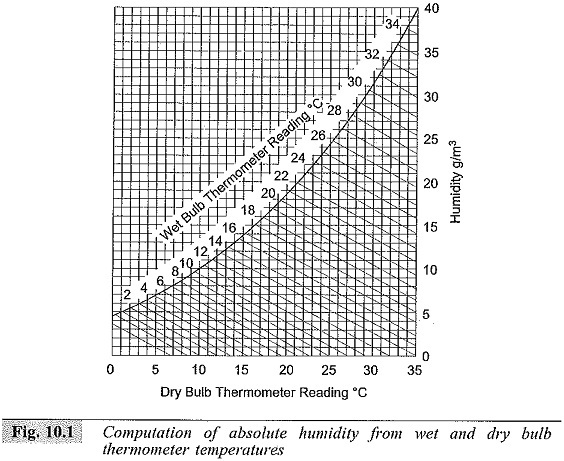 Humidity correction factor h is obtained from the temperatures of a wet and dry bulb thermometer, by obtaining the absolute humidity and then computing h from the absolute humidity. These are graphically given in Figs 10.1 and 10.2.